White kitchens are my fave, but rustic ones come in a close second. I am dying over that hood above that gorgeous range. I would love to cook a big meal there for my family. I am in love with that farmhouse sink!! The windows in the second photo are stunning!!! Sorry you're missing home Tiffany. My husband's traveling so I'm missing him too. 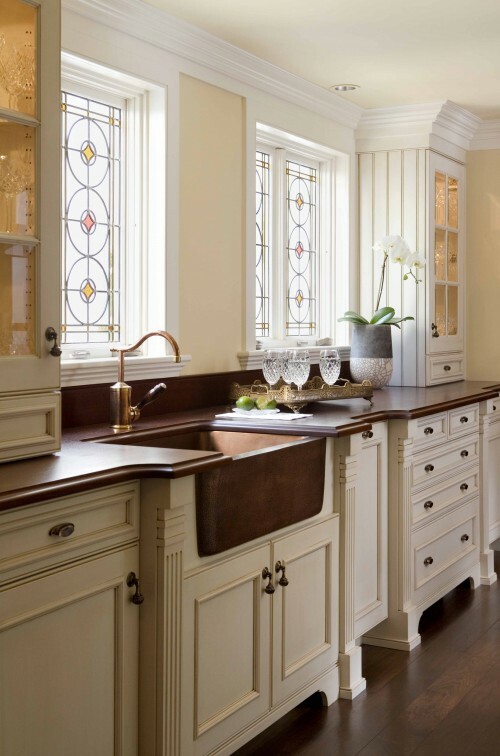 I love love love copper sinks...one day. :) Hope your week slows down and you feel less homesick. Love each of the spaces shown, nothing like a perfect mix of old and new, to make a beautiful room. I like a lighter kitchen mixed in with metals and different textures to create interest. Beautiful Tiffany! Gorgeous pictures tiffany - the second one is my fav! OH MAN! That 2nd kitchen is my DREAM KITCHEN! I love a rustic kitchen. It makes a space warm and inviting. I am in love with that oven hood! 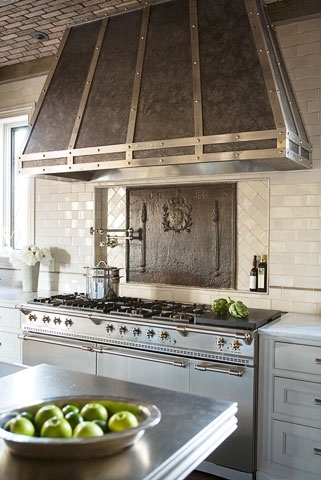 Love that gorgeous range & hood too. Wonder if it's an ILVE like Tina's at Enchanted Home. At 14K I'll just dream about some "rustic' bread for now - ha! p.s. Didn't comment about the LBD, but I sympathize. Been through the whole LBD (late but determined) shopping stress too many times - I'm dress shopping for a summer event NOW! Oh my goodness. That copper sink has my heart. I love the chunky woodwork in that kitchen. Just my style- especially with the stained glass!! Hi Tifanny,I love pictures of kitchens.And these are beautiful. Have a nice day! !hugs from Holland. I'd like to have dinner in the last image.